Southern players and organizations are constantly making their mark in the world of tennis. Here's a list of recent awards, achievements and news in April 2018. Gallatin, TN’s Tennys Sandgren hit a career high of No. 47 after reaching his first ATP World Tour final in Houston. Sandgren battled deep into the final set against American Steve Johnson at the Fayez Sarofim & Co. U.S. Men’s Clay Court Championship 7-6(2), 2-6, 6-4. Along the way he won in straight sets over big-serving vet Ivo Karlovic and rising Brazilian Nicholas Kicker. "I feel like I'm better at engaging myself when things don't go right," Sandgren added about the Karolvic match. "I don't have a lot of experience at this stage and against [Karlovic's serve], you just guess. You can only take a stab at it and guess. I tried to read where he liked to go. The former Univ. of Tennessee Volunteer has had a resurgent year at age 26. His most notable results came Down Under when he battled his way big names at the Australian Open He dispatched three-time Grand Slam champ Stan Wawrinka and Dominic Thien, ranked No. 5. Hyeon Chung eliminated him in the quarterfinals. Last September, Sandgren was ranked out of the top 100 and was No. 228 in November 2016. ORLANDO, Fla. -- Ohio State University capped off a remarkable Tennis On Campus season by defeating the University of North Carolina - Chapel Hill to win its first ever National Championship. The Buckeyes led from start to finish at the USTA National Campus on Saturday evening, defeating the Tar Heels, 27-13, in a championship finale that saw an in-form team of underclassmen take down an experienced squad that was looking for the title that had so often eluded them. 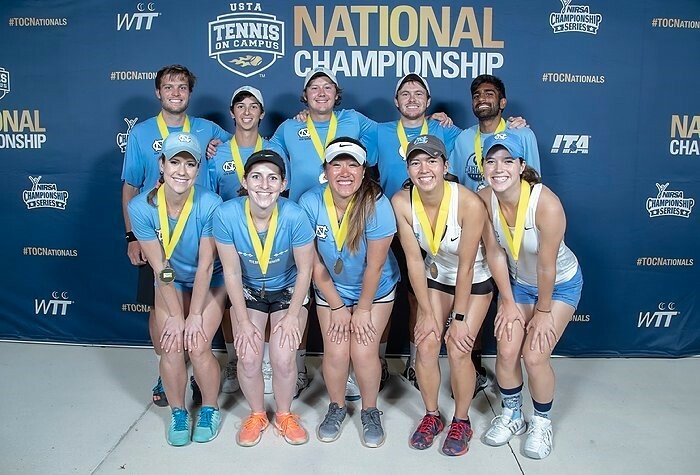 But while Ohio State is celebrating an unlikely title -- they finished third in the USTA Midwest sectional tournament and had never placed better than 18th at the National Championship -- UNC is left with the feeling of coming so close yet again. The Tar Heels also lost in the final two years ago in Cary, N.C. One year earlier, they stumbled at the penultimate hurdle, losing in the semifinals and ultimately finishing third. This year's UNC team includes six graduating seniors who were pushing for one last run at a championship, including senior captain Connor Cooke who has now finished second twice and third once in his four years of club tennis. “It really hurts. We just didn’t have it today,” Cooke said. “We kind of ran out of the tank as far as clutch tennis goes. It’s been an emotionally draining tournament, just all the battles we’ve had. The University of Alabama marked off an impressive weekend at the USTA National Campus in Orlando, Fla., taking home its fourth title at the 2018 USTA Wheelchair Tennis Collegiate National Championships. Maude Jacques and Shelby Baron led the charge for the Crimson Tide, earning spots as the team’s two highest point earners. In total, Jacques won six of her eight matches over the weekend, falling only once in singles to her teammate, Lauren Haneke-Hopps, and posting an impressive six points for Alabama tennis. Baron, a 2016 Paralympian, placed second in her singles flight, earning the team four points. Together, Baron and Jacques, the defending 2017 doubles champions, won their doubles flight, securing their spot in the final. The duo put up an intense fight against Stony Brook’s Nathan Melnyk and the University of Florida’s Chris Herman in the title doubles match before ultimately falling, 8-5. Keshav Chopra, of Marietta, GA, defeated Maxwll McKennon 7-5, 7-6(4) to win the Easter Bowl’s Boys’ 16 championship. Chopra and Coy Simon, of Charleston, SC, finished as finalists in doubles. Chopra won the Boys' 16 singles and doubles crowns at the 2017 USTA National Winter Championships, played at the USTA National Campus in Orlando, FL. Ann Wright Guerry, of New Orleans, and Kate Sharabura, of Atlanta, won the Girls’ 14 doubles. 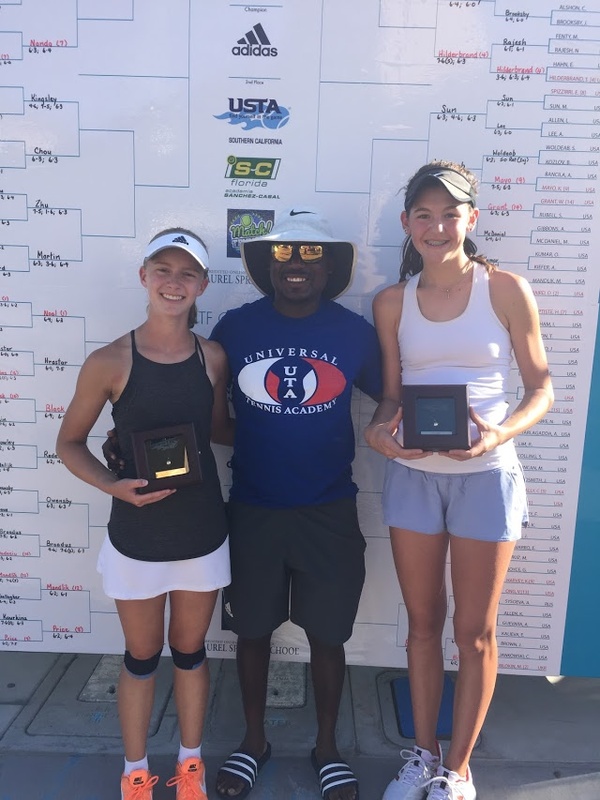 Sharabura's second consecutive Gold Ball, having captured her first Gold Ball in the Girls’ 14 doubles at the USTA Winter Nationals in Tuscon, AZ, in early January, with Gavirella Smith, of New Orleans. Guerry and Sharabura are coached by Noel Wadawu of the Universal Tennis Academy at Blackburn Park in Brookhaven, GA.
Atlanta's Chris Eubanks won the $75K Torneo Challenger Leon and reached the final in the $50K Jalisco Open, both in Mexico. He rose to a career-high No. 184. Another Atlanta native raised a trophy. Taylor Townsend defeated Rachel Duque-Marino 62-2-6, 6-2 at the $80K Hardee's Pro Classic. The tournament was played in Dothan, AL. Hunter Reese, of Knoxville, TN, and Evan King teamed up to win the Elizabeth Moore Sarasota (FL) Open doubles crown. On the losing end of the 6-1, 6-2 final of the $100K was Christian Harrison, who grew up in Shreveport, LA, and Peter Polansky. Victor Lilov, of Raleigh, NC, won the sinles in the Boys' 14 singles at the ITF World Junior Tennis Competition, Jr. Davis Cup. Pam Muncy, of Vilas, NC, won the Women's 4.0 50 & Over NTRP Championship. She defeated Carol Polipnick, of McFlarling, WI, in the final, played in Naples, FL. Adam Shafran, of Alpharetta, GA, reached the Men's 4.5 50 & Over final but fell to Brandt Benum, of Augora Hills, CA.